Makes 7 mini cup cakes previously listed on here on special at £15 now £7.50 i bought mine from Wilkinsons in Newcastle city centre and there was loads on display on Tuesday. These were half price down from £15. Cant find the deal online so might be sold out online. 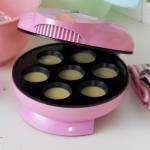 Looks a great product and comes with a free cake decorating kit worth £4.99 and 50 free mini cup cake cases worth £1.99. Bargain for the price and would make great gifts for a child. I dont have an image of the product but have used the image from the previous deal. I paid £20 a month ago from TJHughes for this! ‌ I paid £20 a month ago from TJHughes for this! Not opened mine yet, not had a chance, haha, but was in my local Wilkos earlier... never seen this in store before! Not opened mine yet, not had a chance, haha, but was in my local Wilkos … Not opened mine yet, not had a chance, haha, but was in my local Wilkos earlier... never seen this in store before! so cute.. I'd get a gadget like this. Will have to see if my local wilkos has one, and a cupcake stand! so cute.. I'd get a gadget like this. Will have to see if my local wilkos … so cute.. I'd get a gadget like this. Will have to see if my local wilkos has one, and a cupcake stand! If it's any help we found it on the 2nd floor in Newcastle central on the end of the aisle at everything in that section was half marked price. They were priced up at £15 but with the half marked price went through at £7.50. I actually thought about buying it at £15 until i asked if it was £15 or £7.50 my choice was made :D.
I got one of these for when me and the kids make cakes. Its makes really nice cakes. The only downsize is they are quite small and you can only make seven at a time. I use 2oz and an egg. Anymore mix and you will be loading the thing all night! May have to pick one of these up today! Not in Shrewsbury, checked, and asked! will check my local. thanks.